with assistance of our local guides Issac, Julius and Imanuel. Now Benjamin and Guan are relaxing on Lamu beach. The rest of us spent two days in Ngorogoro Crator and at Manyare Lake on classical safari and are heading back to Germany today. 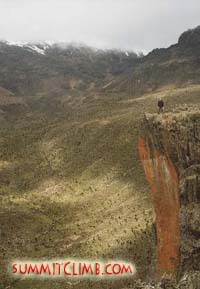 I myself will go up Mt.Kenya again for some more technical climbing. Our trip to the mounatin was blessed by lots of rain. Rather pushing than driving our Land Rover up the Sirimon route we lost one day on the mountain. 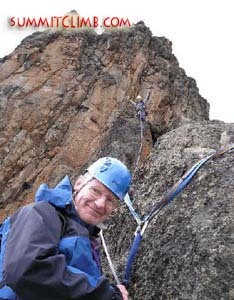 Even so our climbing group, that is Benjamin, Juan, Patrick, myself and our local Kenyan guide Charles could make a successful ascent of the N-face Standard route (a 600m climb, upto 5.6/7) of Bation (5199m). Starting at 4:30 at Shipton's hut (4200m) it took us till 11 at night to get back. On the next day Ursula, Mechtild, Gisela (almost) and Patrick hiked upto Pt.Lenana (4970m) while Heike, who summited the day befor, and the rest of climbers went straight to our next camp Minto's hut. Then we descended down the Chogoria route with it's scenic views of the mountain and the Gorges. After a night at the Mt.Kenya lodge / Chogoria bandas we had to walk 10km down the road due to the wet and muddy conditions. Only there our vehicles could pick us up to drive out the next 20km for us to finally reach Nairobi. While today our group went to enjoy the Amboseli national park on a classic safari I have to organize the last arrangements for Kilimanjaro -coming up next. We will spend the next three weeks to climb the two highest mountains of east Africa Mt.Kenya (5199m) and Kilimanjaro (5895m). We will pass by Hell's Gate, an amazing national park with a lot of non-predator-wildlife and 200m high volcanic rock sculptures, to get used to our outdoor equipment and practice our rock climbing skills. After that we drive to Nanyuki, where we will start trekking up the Sirimon route to reach Shipton's camp (4200m) at the base of Mt.Kenya within two or three days of superb hiking. Our trekking group will surround the beautiful twin peaks of Nelion (5189m) and Bation (5199m), while our climbing group will try to climb Bation by the 20 pitch N-face standard route with some rock sections of grad 5.7. After descending the scenic Chogoria route we will pass by Nairobi to reach Amboseli national park. That is the park with the highest density of elephants in the world and hopefully we will see many other of the fascinating African wildlife as hippos, giraffe, gazelle, lions and various birds. 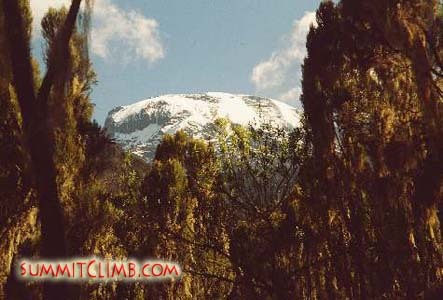 Afterwards we plan to climb Kilimanjaro -with 5895m the highest mountain of Africa - via the Rongai route. 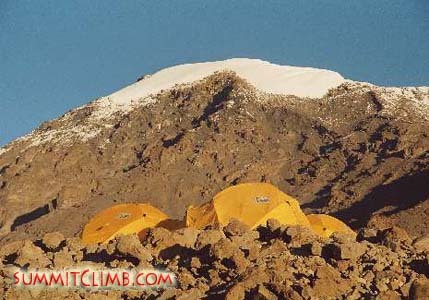 Well acclimated from Mount Kenya we plan on camping at the summit plateau at 5600m -a once in a lifetime experience. We will update you on our process by calling in and sending further dispatches. Are you getting excited for our Africa Trip?